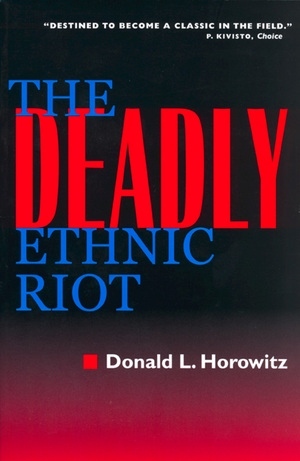 Donald L. Horowitz's comprehensive consideration of the structure and dynamics of ethnic violence is the first full-scale, comparative study of what the author terms the deadly ethnic riot—an intense, sudden, lethal attack by civilian members of one ethnic group on civilian members of another ethnic group. Serious, frequent, and destabilizing, these events result in large numbers of casualties. Horowitz examines approximately 150 such riots in about fifty countries, mainly in Asia, Africa, and the former Soviet Union, as well as fifty control cases. With its deep and thorough scholarship, incisive analysis, and profound insights, The Deadly Ethnic Riot will become the definitive work on its subject. Furious and sadistic, the riot is nevertheless directed against a precisely specified class of targets and conducted with considerable circumspection. Horowitz scrutinizes target choices, participants and organization, the timing and supporting conditions for the violence, the nature of the events that precede the riot, the prevalence of atrocities during the violence, the location and diffusion of riots, and the aims and effects of riot behavior. He finds that the deadly ethnic riot is a highly patterned but emotional event that tends to occur during times of political uncertainty. He also discusses the crucial role of rumor in triggering riots, the surprisingly limited role of deliberate organization, and the striking lack of remorse exhibited by participants. Horowitz writes clearly and eloquently without compromising the complexity of his subject. With impressive analytical skill, he takes up the important challenge of explaining phenomena that are at once passionate and calculative. Donald L. Horowitz is the James B. Duke Professor of Law and Political Science at Duke University. He is the author of, among other books, Ethnic Groups in Conflict (California, 2001) and A Democratic South Africa? Constitutional Engineering in a Divided Society (California, 1991), which won the Ralph Bunche Prize of the American Political Science Association.